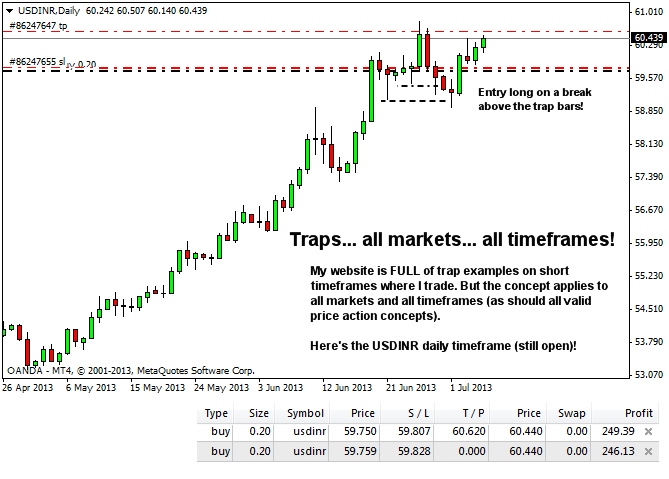 Last week I shared a short article on trap entries and how they're applicable in all markets and all timeframes. This led to a comment on facebook as follows: "When you show an example like that it seems to be so easy, but to get in the trade is actually quite hard." My facebook response was: "Confidence builds with time and experience. If these entries cause problems then spend a period of time reviewing hundreds of examples… trending market, break against the trend which pauses & reverses. ie. study CPB's or Wyckoff springs. Study those that work. Study those that fail. It's a learning process. Also… work on your expectations for individual trades. Could this trade have failed? Absolutely. But the risk was small compared to potential reward. So taking it is the right thing to do. Think profit over a series of trades, not on individual trades." Let's add to that comment now with something a little extra! 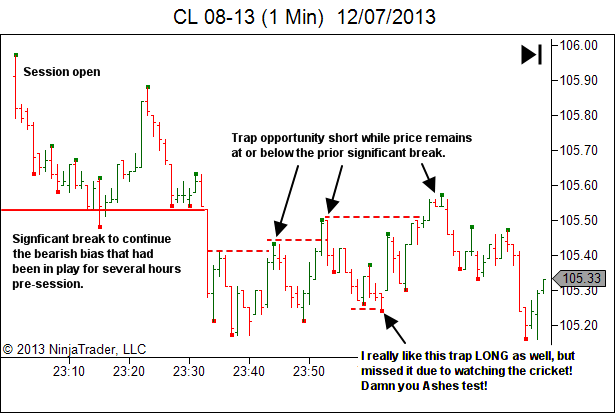 A common reason for difficulty in taking trap entries is our faulty expectations. Price was in an uptrend but has just broken the swing low. 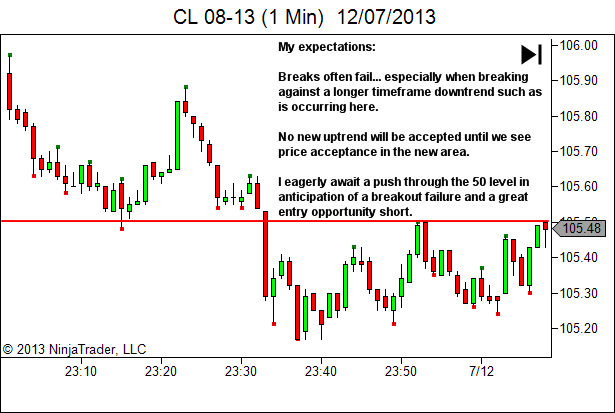 Almost all trading education tells you that the uptrend has ended when a swing low has broken. Prepare for a reversal. Some even tell you to enter short on the break. And yet here I am telling you this is an opportunity long! This goes against all your prior education and all your experience. The same applies for a breakout at the edge of a range. Almost all prior education would have taught you that a break of such a significant level marks the end of the sideways phase and the start of a new trending phase. Breakouts lead to new trends. And yet here I am telling you this is an opportunity to fade the breakout. Again, this goes against all your prior education and all your experience. You're expecting breakout success. I'm anticipating breakout failure! Which will occur? Well any one particular example could go either way. But the fact is that a significant proportion of breakouts DO fail. And when the breakout occurs against a larger market bias, I'd say it's a better than even odds trade. Here's how this one played out. If you look at the 1-min trading timeframe chart it also showed two earlier opportunities as price broke prior swing highs against the larger bearish bias. So again, as stated in the prior article, if traps aren't currently a part of your strategy then please take some time out to consider whether or not they should be! Adjust your expectations. Breaks of swing highs & lows and the edges of trading ranges are not necessarily the start of a new trending move, just because all the trading books say so. When a breakout occurs against a larger market bias, anticipate a failure. 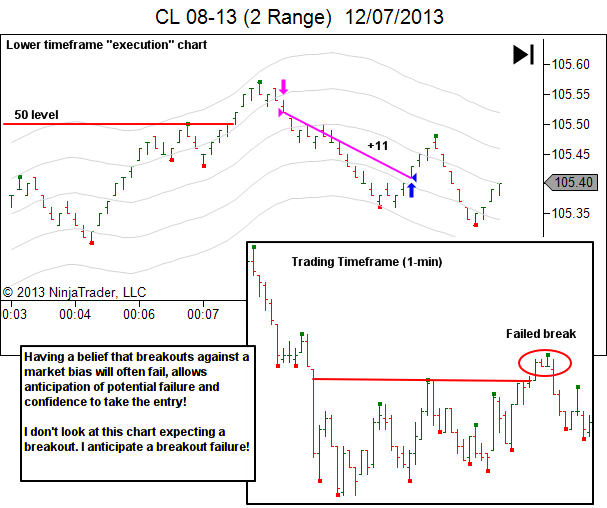 The breakout is not confirmed until price acceptance has occurred in the breakout zone. Keep your focus ahead of current price. If it's going to fail, what signals will price give you? Then watch and wait. Stalk the opportunity from the safety of the sidelines. Does the breakout stall as you expected? If so, you've got a potential trade developing. Your beliefs and your expectations will greatly influence your confidence in taking a trade. So if you're lacking confidence in taking trap entries, is it perhaps because you're expectations are not in line with the reality of the markets? You can change your expectations. You do that through repeated exposure. Whatever market you trade! Whatever timeframe you trade! Find 100+ examples of breaks against bias and study them. Trending markets… find breaks of swing highs/lows against the trend. 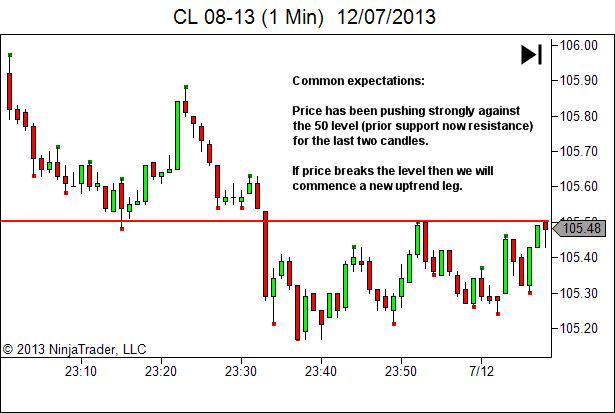 Ranging markets… find breaks around the edges of range support and resistance. Print your trading timeframe chart. Find traps against the market bias. Drill down to the lower timeframe to study them. As you can see… traps provide a lot of opportunity if your market beliefs and expectations allow you confidence to trade them. What is the bias if the market is ranging sideways for awhile? I mean i know it would be neutral, but with neutral bias how will you decide what breakout is against bias? 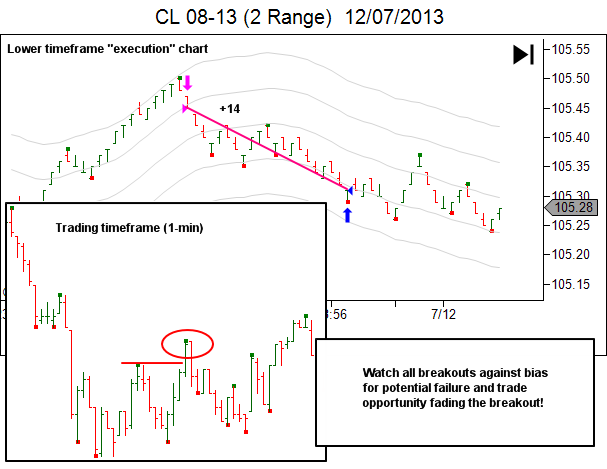 Is a breakout in either direction considered against bias, if the market is moving sideways? If the market is sideways, you’re correct that a break in either direction should be considered a break against bias. However, this is ONLY if the nature of the price movement is not such that it places doubt on the bias and suggests a potential change of structure (YTC Price Action Trader Vol 2 Ch 3 Section 3.3). Thank you Mr Beggs, i appreciate you taking the time to respond to new comers like myself. Lance, I love these references you give back to YTC PAT, helps me review what I have forgotten or missed. 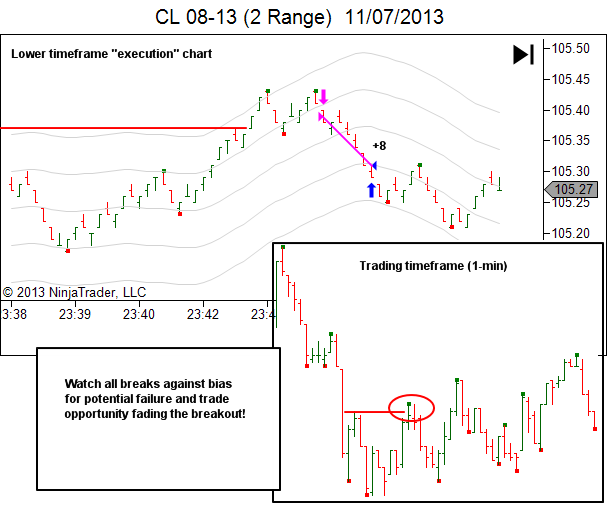 Lance, in the last chart on this page http://www.yourtradingcoach.com/images/stories/articles-2013/gaining-confidence-trap-entries-6.png Why do you like that Trap Long when trend is down, would that entry not be against bias? Yes, it is against the general “session” bias in that the session has moved lower. But it’s not moving lower with any strength. There was a significant bottoming pattern just to the left. Higher highs have been put in place since then. And it’s a retest of the lower bottoming pattern. Price makes a break through a recent stall, right into the lower bottoming pattern. There are multiple layers of support here. If it can’t continue lower, it’s a prime candidate for a trap. With-bias is always the preference. But why wouldn’t you take a counter-bias trade as well, if it offers edge? Just manage them aggressively. And don’t assume reversal – play for reversion to the mean primarily and ONLY consider holding some for reversal if the market shows great potential for that to occur. Thanks very much, that makes sense. I am trying to avoid all counter trend tradess for now since they often put me in deep trouble, although occasionally I do catch a great counter trend move. I think its my mind set and inability to jump out of trade quickly when it reverses and seeing counter entries everywhere. What do you consider a bottoming pattern? Good. If a particular trade or environment is causing trouble, the best option is to avoid it as much as possible. Build on what works. You can always explore counter-trend opportunity later. But get profitable first via with-trend opportunity. The mindset has to be right. You need to be able to cut them quickly. You also need to be able to get back in quickly. It’s interesting you say you see counter-trend entries everywhere. This is not unusual. There was someone (I think perhaps Al Brooks) who said a good plan in this case is to watch the counter-trend trade. Don’t enter it. Just watch. And then use it’s point of failure as your entry with-trend. Of course, the environment needs to be right, but this might be something you want to consider exploring. What do I consider a bottoming pattern? I’m not actually a pattern trader. It was more a general statement describing the fact that price had bottomed. Analysis is done via the momentum & strength/weakness sections in YTC Price Action Trader. I really like a lot all articles that you, Lance, publish on this website. I’m not a newbie to trading but I find many very useful advices throughout these posts. As for me, trading psychology is the area I have to improve ASAP. Thanks for your great feedback. I’m pleased you’re finding value in my writing.